Congrats! The author will be receiving a gift certificate to her favorite online bookstore. And speaking of voting, it’s past time we got you voting for the best stories of the 3rd Quarter (July to September, 2014). We invite you to use the form below to vote on your top three stories. The winners will receive Amazon gift certificates. Votes must be received by the 30th of November. Winners will be announced during the 1st Quarter of 2015. Enter the name of your top 3 stories in the spaces provided. To refresh your memory, you can visit any of them by clicking on the story title. Only one set of votes per email address allowed. Email addresses will not be used for any purpose other than confirm the validity of the vote. At the end of the month, they will be discarded. As always, thank you for helping make SpeckLit the place on the web for micro-fiction. Another three months have passed and as of July 1st, SpeckLit started with a third round of authors and drabbles, meaning it’s time once again to celebrate the best stories that have appeared on the site from April to the end of June. And this time there are more of them! In April we stepped up from publishing once every three days to every other day, bring us to 14 authors and 46 stories. And just like last time, we need help picking the best stories from the 2nd Quarter just as you did for the 1st Quarter. We invite you to use the form below to vote on your top three stories. The winners will receive Amazon gift certificates. Votes must be received by the 31st of August. Winners will be announced the first week of September. Thank you again for helping make SpeckLit the place on the web for micro-fiction. We’d like to thank everyone who took the time to vote for the best stories of SpeckLit’s first quarter. As we said beofre, while we love all our authors’ stories (we wouldn’t publish them if we didn’t), our readers have their favorites. Congratulations to Sierra July and Anne E. Johnson for their wins! And Anne took both second and third prize with Stitching Death and Bully Balloons. Both authors will receive online bookstore gift certificates. We look forward to hearing from our readers again in July for our 2nd Quarter Best Of. As of April 1st, SpeckLit started with a new round of authors and drabbles, meaning it’s time to celebrate the best stories that have appeared on the site since December: eight authors and 40 stories. While we loved every single one of them (we wouldn’t have published them if we didn’t), we would like to know which ones were your favorites. We invite you to use the form below to vote on your top three stories. The winners will receive Amazon gift certificates. Votes must be received by the 8th of May. Winners will be announced the following week. Thank you for helping make SpeckLit the place on the web for micro-fiction. 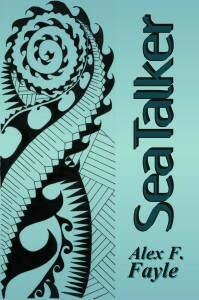 SpeckLit’s publisher, Aia Publishing, is thrilled to announce the launch of Sea Talker, a new novel by Alex F. Fayle. This young adult fantasy book tells the story of Mercaj, a young man whose predestined soulmate abandons him on the night they are supposed to meet. Long lost powers over the sea are unleashed in Mercaj as a result, potentially bringing about the end of the world. You can get the ebook version from all the usual electronic bookstores and the trade paperback at CreateSpace or Amazon. Visit the Aia Publishing website for more information and most online store links.